Herbs , 4-16.5 cm. Leaf blades narrowly oblanceolate or linear, 2.2-11.5 cm. Inflorescences: scape 1.8-12.8 cm. Flowers: sepals faintly or distinctly 3-5-veined, scarious margins narrow or absent; petal claw 1-2 times as long as blade. Heads of achenes 16-50 × 1-3 mm, exserted beyond leaves. Achenes: outer face narrowly rhombic to elliptic or oblong, 0.8-1.4 × 0.2-0.6 mm, 1.5-5 times as high as wide, not bordered; beak 0.05-0.4 mm, 0.05-0.3 as long as body of achene, parallel to outer face of achene, heads of achenes thus appearing smooth. 2 n =16. Flowering spring (Mar-Jun). 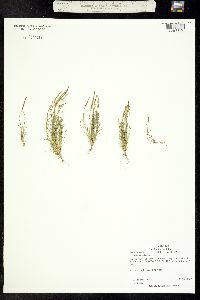 Wet fields, vernal pools, banks of streams and lakes; 0-3000 m; Alta., B.C., Man., Ont., Sask. ; Ala., Ariz., Ark., Calif., Colo., Idaho, Ill., Ind., Iowa, Kans., Ky., La., Minn., Miss., Mo., Mont., Nebr., N.Mex., N.C., N.Dak., Okla., Oreg., Pa., S.C., S.Dak., Tenn., Tex., Utah, Va., Wash., Wyo. ; Mexico (Baja California); Europe; swAsia; nAfrica. Plants of Myosurus minimus from a few sites in coastal southern California, northern Baja California, and immediately west of Riley, Oregon, sometimes have short scapes, so that the heads of achenes are immersed in the leaves. These plants, which have been called M . minimus subsp. apus (Greene) G. R. Campbell, M . minimus var. 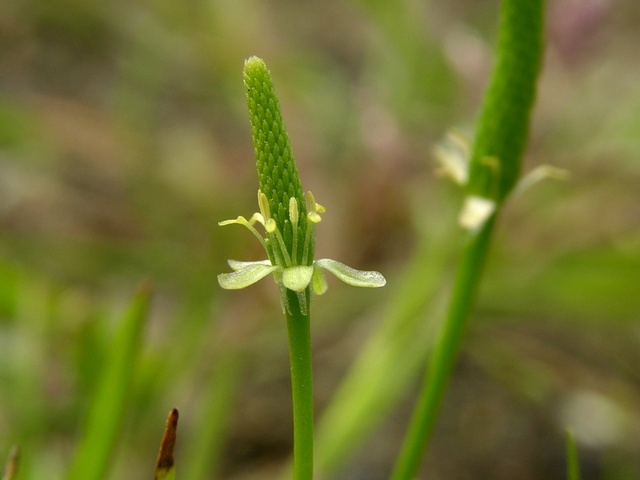 apus Greene, or M . clavicaulis M. E. Peck are indistinguishable from some recombinant lines found in M . minimus × sessilis hybrid swarms (see discussion under M . sessilis ), but they occur outside the current range of M . sessilis . D. E. Stone (1959) has suggested that they resulted from past hybridization between the two species, perhaps at a time when M . sessilis had a wider range than it does now. The Navaho-Ramah used Myosurus minimus medicinally to apply to antbites (D. E. Moerman 1986). I have found this species in five widely separated places in Posey County. I found it abundant in very sandy soil in a forest planting of about 15 year old chestnut about 4 miles north of Mt. Vernon; in a pasture field just south of New Harmony Cemetery; in a sandy by-road along the Wabash River about 3 miles south of New Harmony; frequent in a fallow cornfield on the south side of Pitcher "Lake" about 5 miles northwest of Mt. Vernon; and common in a fallow cornfield along Black River about 2 miles east of Griffin. I found it also in Gibson County, in a fallow cornfield 6 miles west of Princeton, and recently Kriebel has collected it in Daviess County. 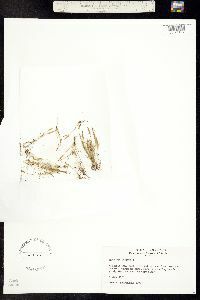 There is a specimen from Montgomery County in the herbarium of Wabash College. The plant is very inconspicuous and since I have rarely botanized its habitat, it may be more frequent than my experience indicates. Schneck reported it from the Lower Wabash Bottoms and Benedict & Elrod reported it from Cass County, remarking that it was "scarce." In 1937 I found it in its habitat in Newton County. I am of the opinion that if sandy, fallow cornfields are worked carefully, its distribution would be greatly extended. Scape 3-15 cm; lvs linear or nearly so, the blade scarcely differentiated; sep yellowish-green, the blade 3(-5)-nerved, narrowly oblong, 3-5 mm, the spur 1.5-2 mm; pet about equaling the sep; spike of pistils 5-10 mm, elongating to as much as 6 cm in fr; achenes 2.5 mm long, 1 mm wide, shortly beaked; 2n=16. Moist soil; circumboreal, in Am. chiefly western, extending e. to s. Ont., Ky., and even Va. Apr.-June.